Buy 1 for $17.85Buy 2 / Save $0.95!Buy 3 / Save $3.57! Pot marigolds are hardy annuals that flower all summer and seed themselves for next. Yellow or orange, their bright daisy-like flowers attract insects, bees, and butterflies. The light green leaves have a pungent aromatic scent. If the flowers are open in the morning it is said that you can be sure it will be a fine day. In The Winter's Tale, Shakespeare described their habit of closing up when there is no sunshine. "The Marigold that goes to bed wi' the sun, And with him rises weeping." Calendula comes from the Latin calendulae meaning the first day of the month, as they always seem to be in flower then. Originally from the Mediterranean and Iran, marigolds were used in India, ancient Greece, and Rome for health purposes and as a dye. Fast growing annuals with an erect, sometimes spreading, habit on branching stems. The soft hairy leaves are lanceolate. Height and spread 24 inches. The orange, yellow, or apricot flowers are daisy-like with ray florets about 3 inches across. Marigolds must be among the easiest plants to grow. Almost any soil will do as long as it is not waterlogged and they like the sun best. Sow seeds outside in spring, cover with a little soil and they will pop up and colonize merrily. Deadhead to encourage even more flowers. The juice or infusion of the leaves and flowers of this most health restoring of herbs are used, both fresh and dried, in a great variety of oils, creams, lotions, face packs, and steamers to help support all skin problems from acne to sunburn, tired eyes to warts. Alone or with other herbs it is an effective colorant and conditioner. The green, fragrant essential oil of calendula has rejuvenating and rejuvenating properties when used in cosmetics, massage oils and baths. Used in a base oil, it will effectively reduce scarring. Health-wise,the entire flower head is used to help speed recovery from injury. 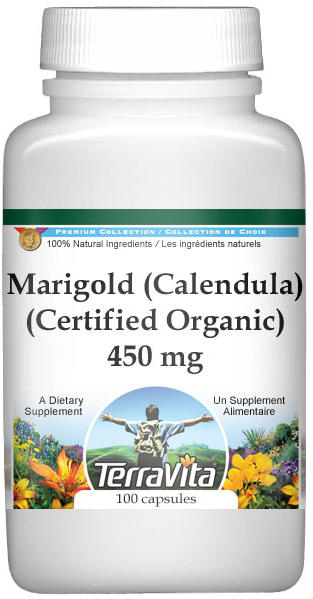 Calendula promotes the rejuvenating process in nearly all body areas. It has been used tO rejuvenate gastric ulcers, gallbladder issues, congested lymphatic nodes and inflamed skin. An external cream application can be very useful in cases of eczema and other skin inflammations.